I do like small gardens, even those tiny backyards that come with a terraced house. The subject is top of mind at the moment because we’ve just bought the most minute terrace ( or ‘cottage’ as I like to call it- makes it sound cuter than it is) to rent out and I’m trying to turn the rather bare backyard into a thing of beauty, that is both inexpensive to put in and low maintenance. In fact I got my class to look at some photos of it in class this morning and asked them to come up with some ideas…..well why not! But how did we get there you ask? Well I think the same basic principles always apply to all gardens, whether big or small. First- secure your boundaries, put up trellis to blot out the neighbours and then paint fences a grey, green or black colour to unify the panels and provide a smart background for plants. As I said, the lady who owns this garden was very elegant , and all the clues I needed about colours were there in her house- a sophisticated restrained colour palette was the obvious answer so I went with blues, purples, creams and white, with a lot of green mixed in. That purple rose above is called ‘Rhapsody in Blue- I love it! Don’t you just love a clipped box ball paired with something spikey- opposites always look attractive together. At least that’s what I tell my long suffering husband when he’s 15 feet up a wobbly ladder and I’m spikily egging him on to prune a vicious climbing rose, with me pointing where to make the cut with a long cane. The cane is also useful for wacking his knuckles if he’s in danger of making the wrong cut too- good tip that! Even in the smallest garden, detail is important, and not to forget that the detail needs to be at different heights to draw your eye upwards. It’s a bit like being a woman with huge feet…..wear a short skirt, a low cut top and pink lipgloss and all of a sudden no-one is concentrating on your feet.So I added an archway…. The planting was about 70% evergreen so that the garden was low maintenance and looked good all year round, with a lot of variegation to add fizz, and seasonal pops of colour using perennials like Salvias, Geraniums, Dicentras and spikey Libertia- as I said before, spikey things are good!. 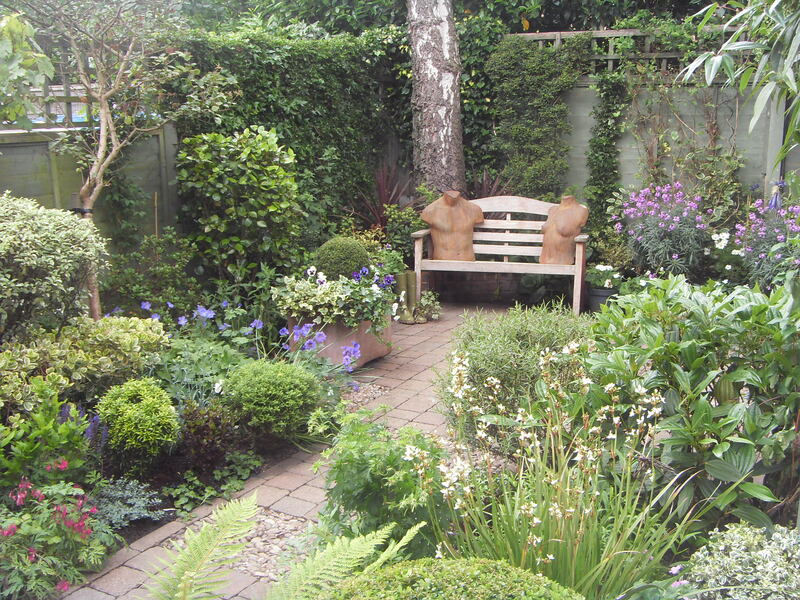 It’s great to look back isn’t it and see how easy it can be to transform a small space by doing simple things like getting rid of the grass, painting fences, using inexpensive paving……… and, of course, buying ENORMOUS quantities of lovely plants. Have fun! This garden looks delightful. It’s strange how putting so much more planting into a small area adds a sense of spaciousness. Yet it’s also said that in a small area, a few possibly oversized bold ideas are best. How would you explain this apparent contradiction ? Could the spacious feeling come from height of planting maybe, screening out the boundaries? Yes, I think any blank space always looks smaller than one filled with interesting detail-and your point is good- blot out the boundaries AND put some oversized plants in! I remember this garden and loved this water feature at the time. It was a very beautiful garden which proves your point that yes you can make the biggest impression in the smallest of spaces with imagination and know how. This year is definitely going to be the year I get my garden going. I am going to add trellis to my fence first and think I might even take photos as I go along. Good luck with your new project. Look forward to more encouraging and inspiring blogs. Good luck Mandy with your new garden projects!